November is the beginning of the real winter weather in China’s northern and high altitude areas. It can be an ideal time to travel in China after the peak season crowds head home and before the worst of the chilly winter weather arrives. North China sees its first snows, but Central and South China have moderate and comfortable temperatures. 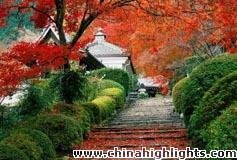 November is a good time to see fall foliage in China, as the leaves change color after the first frosts. Tourism: November is a great time to travel in China so that you can avoid large tourist groups. 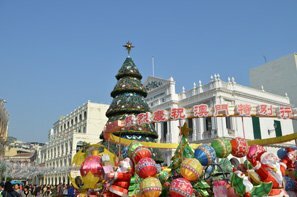 The comfortable weather and sunshine in the south is great for outdoor activities, sightseeing, traveling around, and shopping in the street markets. You can also appreciate the amazing fall scenery in many places. 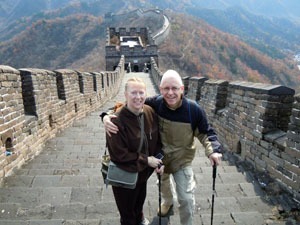 You can see fall colors around the Great Wall, the Yellow Mountains, and the Yangtze River. Red, gold, yellow, and brown hues create an amazing view and the sky is usually clear in the dry season of autumn. 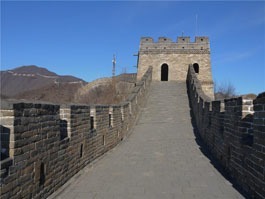 Visit China before the snow falls. November is the low season for Chinese tourism, so you can benefit as prices decrease substantially from what they were during the high season. Read more about the Top Places to Visit in China in November. North China gets crisp, cool, and clear weather, and the locals love to see the fall scenery and exercise during the day. Beijing gets cool days and it usually stays above freezing at night. The average temperature range is 0–10°C (32–50°F) and there is typically just 1 day (13 mm, 0.5 in) of low rainfall in November. Beijing and the mountains to the north, where the Great Wall is, get their first snowfall and it usually freezes at night. It is usually dry, clear, and only lightly polluted this month. Xi&apos;an will be a little warmer than Beijing, averaging 4–13°C (39–55°F). The days are still pleasant, and most days are clear. It rains infrequently, so this is good weather for touring and shopping in the street markets. Clothing: November is cold at night. Wear a coat, gloves, and head covering as well as lighter clothes. Beijing: It&apos;s a good time to visit the Great Wall to see the colorful autumnal leaves on the mountains. It&apos;s also less crowded when visiting the Forbidden City in November after the peak season. The cool temperature and dry weather is comfortable for doing outdoor activities. There are generally cool or warm days and cool nights that are well above freezing in East China. The cool and dry weather is great for hiking. Take Shanghai as an example — the average temperature range is 9–17°C (48–63°F) and there are typically 5 days (42 mm, 1½ in) of low rainfall in November. Shanghai generally has pleasant autumnal weather and there may be fog in the mornings. However, a cold snap might bring bitter windy weather with it. Red and yellow leaves decorate the city. 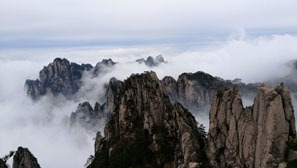 Huangshan: The drier and cooler weather is good for touring and hiking in the Yellow Mountains in Huangshan. Nearby, Hong Village and Tachuan are particularly famed around the country for their colorful autumns. The area around the Yangtze River cools down significantly in November but it is still fairly comfortable. The average low temperatures are still above freezing and it rains for about one day out of three. Take Chengdu as an example — the average temperature range is 9–16°C (48–61°F) and there are typically 4 days (16 mm, ½ in) of low rainfall in November. Zhangjiajie shares similar weather to Chengdu. Clothing: It is windy and cool so a warm base layer and a jacket are recommended. 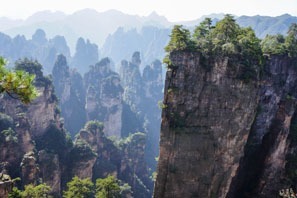 Zhangjiajie: The mountains in Wulingyuan in Zhangjiajie Prefecture feel cooler so it is good weather for a strenuous hike. The hills and valleys are beautiful with many colors and shades. 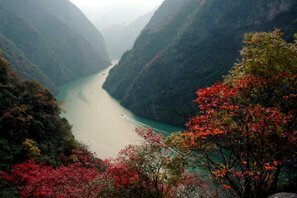 November is great time to climb on mountains for bird&apos;s-eye view of the Li River. South China&apos;s temperature is comfortable at about 20°C (68°F) during the daytime. There is still some rainfall in November, so it won&apos;t be too dry. 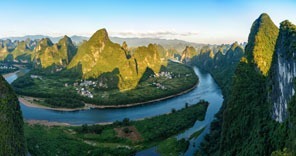 Take Guilin as an example — the average temperature range is 11–19°C (52–66°F) and there are, on average, 13 days (40 mm, 1½ in) of rainfall in November. Hong Kong benefits from warm and sunny weather, which is ideal for outdoor activities, sightseeing, and shopping in the street markets. There is little rain. November and December are the most pleasant months. Clothing: The weather is changeable in most of the region. It is generally warm, but it can get cold unexpectedly. You&apos;ll need warm weather clothing and a jacket. Guilin: Guilin cools down with much less rainfall and more sunshine, which makes for better touring, hiking, and biking. Fewer tourists also make for a more enjoyable time. The Potala Palace is less crowded in November. In most areas, the temperature falls significantly — it gets cold and snow starts to cover the ground. There are usually no rainy days in November in West China. The mountains are cold though and receive snow. The amount of rainfall varies a lot as well. 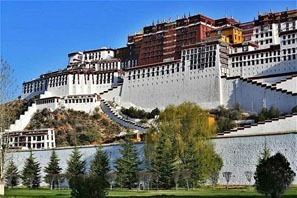 Take Lhasa in Tibet as an example — the average temperature range is -3–15°C (27–59°F) and there are usually completely clear days in November. In the remote northwest area, the average high temperature is just above freezing, and it freezes at night. For example, Urumqi has temperatures that average -8–0°C (18–32°F). In Yunnan Province, Dali and Kunming both have cool weather with occasional rainfall. Lijiang, however, has cold nights that are just above freezing. Clothing: Take winter clothes and you&apos;ll need to take a coat with you everywhere. For Tibet, dress in layers and wear sunglasses. Tibet: Tibet has its low season in November. As tourism drops from October, you will get a more authentic experience. The people around you will mainly be local Tibetan people. Also, tickets and accommodations will have lower prices and you will encounter fewer crowds. November is a good time to avoid tourist crowds. Planning a China trip in November? Our travel advisors are happy to give you suggestions and guidance. 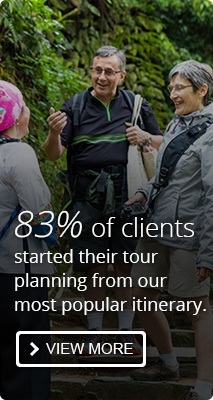 Let us help you plan a personalized November tour.